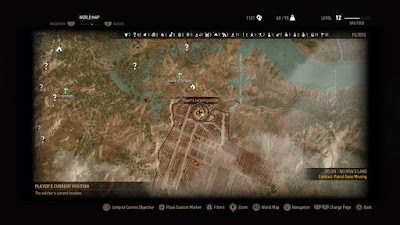 - You can trigger this quest by travelling to the House of Respite and / or the Nilfgaardian Army Group ‘Center’ Camp, both of which are found in the far southeast corner of Velen. It’s a bit of a trip across boggy terrain. - Upon arrival a quest will appear in a small outlying camp between the House of Respite signpost and the camp in the south. Check it to find a woman who will ask you to inquire about her son, who went missing while soldiering with the Nilfgaardians. Use advanced Axii (second or third level) to loosen his tongue. Compete the quest Contract: Patrol Gone Missing. You can find it on the Notice Board outside his tent. - A large area of interest will appear to the northwest once you have the info. Approach it from the road to the east and you can find a dead horse and some footprints with your Witcher Senses. Follow the footprints into the battlefield and you’ll find Ghouls waiting for a fight; kill ‘em off. - There’s a dangling body at the end of the footprints. It’s probably the one Geralt wants, but he needs a bit more. Check near the base of the scaffold where the man’s hanging to find an Unsent Letter sitting in the dirt. Take this back to the woman for your reward.